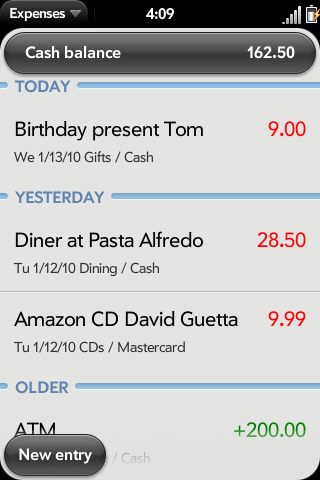 With Expenses you can fast and easily record expenses and income of cash, checking, credit card, etc. on the go. 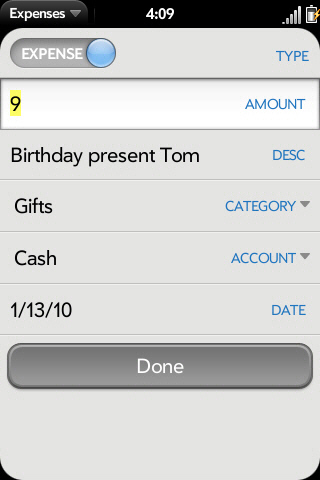 You can add notes and categories to your transactions and define your own categories and accounts. Balances are kept for each account. A self learning text completion feature makes data entry easy, especially for recurring entries. Collected data can be sent to your PC via email where you can analyze it with Excel or import it into your favorite desktop accounting software. A clever clean up feature allows keeping only current entries on the device, while maintaining balances. With Expenses, bookkeeping is fun! The application includes a comprehensive manual explaining every feature in detail. Also available in German / Deutsch and Spanish / Español.